We begin to go through our initial dynasty rankings and start with round one. 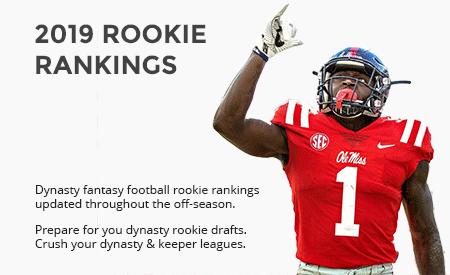 Editor’s Note: Make sure you’re ready for your dynasty league rookie draft by checking out our 2018 Rookie Draft Guide, our current Dynasty Rookie Rankings and our convenient Rookie Draft Cheat Sheet. There are simply no better resources out there for dynasty fantasy football draft preparation. This year’s rookie draft is pretty exciting based on the perceived depth of the running back position. In fact, you can make a strong case that 1/4 of the teams in the NFL found a new starting running back in the draft, including the Giants (Saquon Barkley), Redskins (Derrius Guice), Browns (Nick Chubb), Seahawks (Rashaad Penny), Patriots (Sony Michel), Buccaneers (Ronald Jones II), Lions (Kerryon Johnson) and Broncos (Royce Freeman). While many of those backs will likely find themselves in a committee and history showing us some will simply be busts, this is a first round that’s going to be dominated by the talent at the ball carrier position. If you’re a contending team from last year and have a late pick, it’s also looking like a great year to need a receiver as the depth of the running back class will likely push pass catchers like DJ Moore, Calvin Ridley, Courtland Sutton and more down further than you could get them in most years. In short, the depth of this class looks solid. The challenge is there’s a lot of debate (more than any year I can remember) in terms of what order players should be ranked from right around 1.02 through 1.07. We’ll be working all Spring and Summer to sort it out! Let’s dig in with this year’s top twelve, as comprised by our initial consensus rankings. Keep in mind, these will continue to fluctuate throughout the off-season as we get news from rookie minicamps and see some more free agents sign. For more information on all of these players, make sure you click on them and view their initial rookie profiles. The tiers and commentary I’ll make on this post are my own, comprised of my opinions. Tier one is comprised of one player, and one player only. As we’ve said all off-season, Barkley is in a tier of his own. There have been a few running backs over the past ten years or so who have generated excitement like Todd Gurley, Leonard Fournette and Reggie Bush, just to name a few. However, nobody has taken rookie drafts by storm like Barkley since Adrian Peterson so many years ago. There are high (likely unrealistic) expectations for Barkley but he’s truly talented and physically gifted in every area. He landed with the Giants who should give him the keys to the offense from day one. Barkley will be the 1.01 in virtually every rookie draft this off-season and will likely be a top ten selection in dynasty start up drafts as well. The only risk you take with taking Barkley is turning your back on some amazing trade offers that will come your way. Great article and I am not one to nitpick but the Lions moved up in the second round to get Kerryon Johnson, not the first. This is what happens when you type 14,000 words in three days. I’ll adjust. 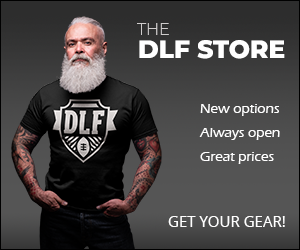 Yup………..Danton was a class act with mentioning it in a classy way before some clown decided he should be the editor for DLF. Either way great writing for sure………keep it up! Very classy Danton…….Love that you did not go all crazy over a simple overlook by another human being. Anyway just thought I’d share my 1.03, 107 and 1.08 picks in a dynasty rookie draft that began today……I acquired the 1.03, 1.07 and 1.08 picks and picked up Penny, Chubb and Sutton with those picks. I am a Broncoholic so was hoping one of their early picks fell to me and both of them did at 1.07 but wasn’t going to take both. Took Penny at 1.03…….as a Chris Carson owner it only made sense! I didn’t want anything to do with Guice at 1.03 but would have strongly considered him at 1.07 (he went 1.06 ) only cuz I own Perine and Kelley but he was gone at 1.05. Hope that helps y’all with figuring out the draft flow. Next dynasty rookie draft is next weekend in a salary cap league where I have basically traded my 1.11, 2.11 and 3.11 for the 1.08. I want to make darn sure that first round pick counts especially now that RSO has added the ability to give them 1st rounders a fifth year option when it comes to their contract! Will there be a mock for 2QB leagues or it wouldn’t much different? I’d think as many as five QBs could go in the first round in SF/2QB drafts. I haven’t seen a draft with such unclear tiers in my time playing dynasty. Beyond Barkley, there’s just no sure thing. Penny and Jones are in good situations for early success, but I question their talent. Sutton is buried on teh depth chart, but in a couple years Thomas or Sanders (or both) could be gone and he could be a WR1 and I like his talent a lot more than Moore’s in Carolina. Sony Michel might be the biggest boom/bust pick I’ve ever seen. Chubb was one of my favorite RBs coming in and I’ve consistently heard of him falling into the mid or eve late first due to the Cleveland backfield situation. At best he’s a 2 down back with Duke eating into his carries (and that’s assuming Cleveland totally writes off Hyde as wast eof money, which he totally was). Freeman looks to be in a good spot, but college usage was through the roof and Denver has had this mancrush on Booker for years. I wouldn’t be shocked to see them totally split time. And K Johnson to me is the biggest fool’s gold in this draft. 1.12 is a great time to take him, but from what I’ve gathered and what the guys in my league are expecting, he’s a top 6 pick ahead of Freeman, Sutton, Ridley, Kirk and even Jones. I don’t think it’s ever been the RBs in Detroit that couldn’t rush for 100 yards, it’s the system they’re in and the team they’re on.